I am sick, sick, SICK of listening to Sonny, Jason and Carly blame other people for their misdeeds!! Sonny is just ridiculous in terms of his thinking and his rationalization of what he does and who he is. The guy is a mob kingpin and he is constantly blaming others for hurting his family….Really??? Dante hurt Michael more than Sonny??? Really??? Because last I checked, Dante wasn’t the one who got Michael shot…It wasn’t even Claudia who was responsible for that….The blame for that rests with Sonny and Jason and Carly for exposing Michael to the dangers of the mob and the enemies that come with that life. And, by the way, Dante did the right thing by telling the judge the truth. 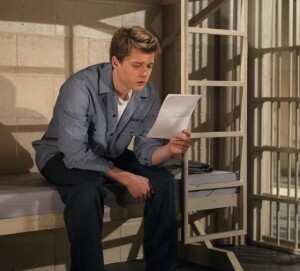 It was Sonny and Jason who – by executing a cover-up – got Michael locked up. The idea that a judge would sentence an 18-year-old to five years of hard prison time for protecting his mother and newborn sister is so ludicrous – it’s not even in the realm of possibility that it would happen. And would someone please tell me why the judge didn’t sanction all those who perjured themselves in connection with the cover-up – most of all Carly? The most truthful words to come out of Carly’s mouth were the lies that she told to Dante Tuesday. Carly told Dante (Dominic Zamprogna) it wasn’t his fault that Michael was in prison, it was her fault for exposing him to the mob life. But not in Carly’s mind. You see, SHE doesn’t really believe it. Carly (Laura Wright) is lying to Dante in order to give him a false sense of security – and have Jason take him down. Even more upsetting to me is that she is going after Lulu (Julie Berman) too….Lulu who has done nothing wrong. Another thing I can’t stand about Sonny (Maurice Benard) is that he does all these really horrific things and then he goes to church, as if that cancels out all the people that he’s killed or ordered killed. And I really, really HATE the way Sonny and Carly ALWAYS end up back in bed together….and judging by the upcoming preview pics released by ABC, they’re going there AG-ain. In my opinion, there is WAY too much emphasis on the mob….and I have to admit, it’s losing me.